Union Coop received the Dubai Chamber Corporate Social Responsibility (CSR) Label 2018 for the Sixth year in a row on Sunday. Dubai, UAE, October 01, 2018: The Dubai Chamber CSR Label recognised the notable efforts of Union Coop in the field of corporate social responsibility and its commitment to developing its practices in the respective field. The event was also a celebration of the Union Coop initiatives that supported vital sectors via social and environmental initiatives and activities. The CSR Label certificate was received by Mr. Suhail Al Bastaki, Director of Happiness and Marketing Department at Union Coop from H.E. Majid Saif Al Ghurair, Chairman of the Dubai Chamber. In order to honour the winners, Dubai Chamber held an official event at its premises.The event was attended by Mrs. Dareen Jamal Awida the Deputy Director of Business Strategy & Corporate Development at Union Coop and a number of managers and employees of Union Coop and other companies that are part of the CSR Label. The Dubai Chamber CSR Label was launched in the year 2010, aimed at offering a free framework for evaluating responsible practices and help companies set and develop their strategies towards these practices. Consecutively earning this prestigious CSR label denotes Union Coop's constant tangible efforts in the field of corporate social responsibility and its commitment towards the society. The label is based on the highest global standards and practices that firms in the Middle East, particularly in the UAE and Dubai should meet. 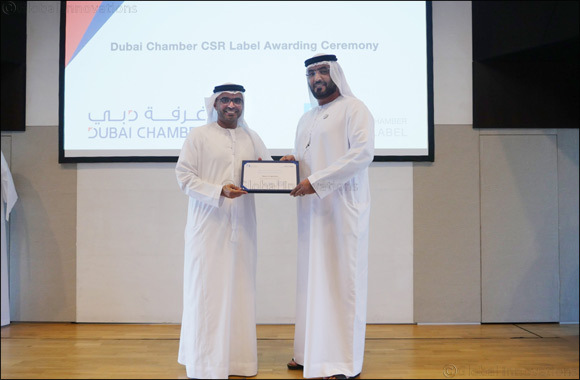 Dubai Chamber Corporate Social Responsibility (CSR) Label also contributes towards the establishment of an accountable and sustainable commercial community, because obtaining this label makes companies operate in a specific framework to apply the best responsible practices that meet their needs and their clients' expectations at the same time. This not only grants them success but creates a healthy working relationship between clients and the society.